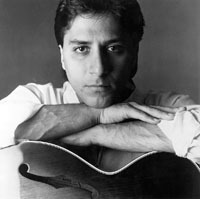 Joseph LoDuca, composer extraordinaire and very busy guy. Thanks very much for taking the time to chat about your work. I know you're a very busy guy. I have seen some interviews with you already. In fact, the MCA site has a very nice piece which covers how you got started and some of your early work. I didn't want to go over that ground again, but was very interested to talk about some of the things you've done lately such as the Emmy-nominated music from DESTINY (36/212) and THE BITTER SUITE (58/312). When did you first hear about THE BITTER SUITE ? What was the first clue you got that this was coming? It all came from Rob [Tapert]. I generally get the sense of what's coming down the pike. It was April or May of last year, maybe a little sooner, and Rob said, "We're doing a musical". My first reaction was, "Yeah, sure", but then after thinking about it for a minute, I realized we've done crazier things. [laughs] He strikes me as the kind of guy that when he says something or plans to do something, he really means it. Yes, he's already several steps ahead of us. We had early discussions about what the tone of the musical would be, what the subject matter might be. For you to come up with your initial plans did he give you a story concept? Absolutely. But you have to start with the basic concept of "What would a Xena musical be"? We both agreed it could not be "Disney". We weren't going to go that route. It had to be true to Xena's character and true to the tone of the show, which of course expanded quite a bit from the last seasons. We started out with a character who barely cracked a smile. Th CD was released the third week of March. I've noticed over time that the character evolution is definitely reflected in the music. When the first CD came out, I was very much looking forward to that and enjoyed it. But when I heard the second CD I said, "This is something very special," because the music had matured and grown with the character. It's richer, deeper, and has expanded in many directions. This is aside from the musical, but with Lucy delving into the comedy and striking gold there, as one small example, it becomes more fertile ground to try things. The evolution of Joxer as a regular presence in the story in another example. To pull off a show like DESTINY (36/212) and to have that in some ways lay the groundwork timewise for THE DELIVERER (50/304) and THE DEBT (52/306), and to have Rob come up with that great plot arc -- once again, only the fans can really appreciate that. You have to watch regularly to understand there's a five episode arc that leads to the musical, and this is the only, in some ways inevitable, resolution to what's taken place. It's great, he really worked it out. Certainly all the aspects of the story, the Kabala, subtext, this is all Rob's intention. In the best of all possible worlds I would have been involved in writing the music last summer. That didn't happen. It didn't happen because the story wasn't really ready. There were a lot of things that had to be worked out. It was certainly worth waiting for. The challenge was to be presented with the story as the season had begun, literally, then to try to make it happen within the context of delivering the two shows after the season had already begun -- to make it work in and around the existing schedule. This was a challenge for me to do all this with THE DELIVERER (50/304), THE DEBT (52/306), MATERNAL INSTINCTS (57/311), not to mention the Hercules musical we did, the dance contest episode. Ah, yes, ...AND FANCY FREE (H67/408). Wonderful stuff. There were some episodes that relied on musical directions that took us to places we hadn't been before. So it sounds like you basically got no sleep from last summer onwards. [laughs] It was pretty challenging, but it was very invigorating. Those of us who work on the show have come to know the characters. The writers have matured the characters and the performances of the actors just get better and better. These are people we knew very, very well. It wasn't as though you had to invent these characters. They already had funny costumes, so having them sing was the next logical step. The places for some of the songs did not change. A song like "War and Peace" was in there from the beginning. We knew we were going to have the Sharks and the Jets. That was a given. The "torment" song was one we really didn't understand until the end. 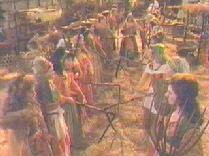 The Xena/Gabby duet, the fact that it was going to be broken up into two parts, came as an outgrowth from the development of the story. The song about forgiveness was pretty much always in there. That seems to be a very popular piece. Most people seem to like the music from the episode, but that one seems to get a little more reaction than most. I'm glad everyone enjoyed that. That was the one song where I actually wrote the lyrics. There were two lyricists involved in the other songs. They did not work together. We commissioned them to write specific songs. They were just wonderful -- Pamela Phillips Oland and Dennis Spiegel. Besides being extremely talented at what they do, they were just great people to work with. I was on the phone with them day and night and when we needed them they were there. Rob was very involved in the creation of the lyrics in terms of specific things. We had to bring them up to speed, and they very willingly and wholeheartedly got into who these characters were. When you write something Ares is going to sing you'd, come across a line and go, "Ares would really never say that because his world view is this not that ". But they got it and got into it. 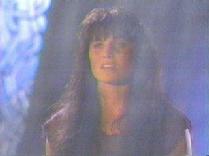 Xena gets to reconcile with her son, Solan. That was the first time I had ever worked that deeply in collaboration with lyricists. It was only out of the confidence of working with them that when it came to write the final song, Rob and I had so many discussions about what the song had to be, what it had to say, what it had to accomplish. We had to say Solan's name for those who didn't tune in every week. There was a lot to cover. We talked in great length about what the theme of the episode was. It was logical, it was something I had to write because there had been so many discussions with Rob about what the songs and the episode was about. There's one line in that last number that's gotten more conversation than any other, "The love of your love is you." A lot of people have their own interpretations as to what that means. Good. As they well should. I'm curious as to what you mean. It's really just the turn of another phrase we all know, the enemy of my enemy is me. When you turn it, it also implies something else, doesn't it? As in all lyrics or poetry you end up implying a lot more than what is said. That was probably the one song where you could afford to be a little interpretive. In other songs there were so many places where you had to be specific to get a point across. Like I said I have this wonderful admiration for the lyricists because they hit all their marks. They hit them all. I'm glad people like that song. People also like Callisto's number in the beginning. "Peace/War" also seems to be a tremendous success, I've heard people divide themselves up and start singing that. Very funny, very funny. I love the line, "You are the most divine delicious warrior, a man can't help saluting your return". [laughs] It's so crazy, warriors blowing kisses. That brings us to Jeff Calhoun, our Broadway ringer. He was the choreographer, right? He was the choreographer and also, I don't know exactly how this worked, but he was involved in directing. I think he was involved specifically in "War and Peace" and many of the musical numbers. And yet here you were, miles away, doing all this stuff remotely. I flew out for a couple of meetings that included Chris Manheim and Steve Sears, who [both] had wonderful ideas. Some of the meetings I had with Rob were face to face. I really wanted to be in there, but I had all these other episodes to work on too. We had crazy ISDN sessions that would start here at 1 or 2 in the morning to New Zealand. I have to thank Nic tenBroek. He was also very good in New Zealand working with the singers and trying to convey what he could observe since I couldn't be there. He was my eyes and ears and worked with the singers. I was patched in directly for all those sessions. It was all digital quality. I was hearing the sessions as if they were on the other side of the glass, but the glass had a curtain on it. Nic helped out on so many technical issues. Julie Moran of ET fame played Gabrielle's buddy in THE BITTER SUITE. Were the songs recorded before shooting? The songs were recorded before, but they were done to synth tracks. I wrote the songs in about nine or ten days. It took a day to write a song and a day to produce a demo. There were seven songs, and various short pieces which included things like "Joxer the Mighty". And you did all the music? Yes. They were produced with synth tracks and demo singers, who were replaced as quickly as possible with Kevin, Lucy, and so forth. Once we had the first rough edit of the film, I rushed through to get the songs recorded by early December. I orchestrated the demos more fully. We produced those, mixed those off, continued to refine the vocal performances. There were so many odds and ends -- Warrior #6, Villager #3. We like this guy, no we don't like that guy. We had Georgie Jessel on the vocal demo and the actor they chose looked like Don Knotts, so things had to be replaced. Warriors in the demo were pretty buffoony. That had to be changed. Were there a number of last minute changes? I don't know if you'd call it last minute. The craziness came in when you do the final recordings because the orchestra will play the tempo slightly differently than the synthesizer. So two days before Christmas I have to thank Rob Field for making all those minute adjustments. Nic had to slide vocals. Those guys went above and beyond the call of duty to get everything to work. Ninety percent of the time what I do is post-score. The editing is done and the timing is set. The picture won't change. You're dropping in after the fact. I might not see a special effect. I might just see a big card that says, "Xena gets picked up by a big bird" and make the music not having seen it, but that's OK. Early or in mid-January we recorded the rest of the orchestra score. Then we fit in those last cues and pieces of the puzzle right up to the last minute. My involvement started heavily in November and went right to the week before the episode aired. We worked in and around the production schedule. Our post-production supervisor Bernie Joyce was very accommodating in terms of getting me some breathing space so I could work on the musical in a more focused way in concentrated intervals of time and still get some time off for Christmas. [laughs] Which doesn't always happen. With some exceptions, the episode seems to have really been well-received. I've read a lot of commentary and while some people may or may not have a problem with things like Gabrielle's "Drop and Drag", the reaction seems to be very positive, certainly from the musical aspect. I think that's so wonderful. We knew we were doing something special for episodic television. A lot of us had the attitude, "They may hate it, but they can't d*mn us for trying". The fact it was successful and well-received gives everyone a good feeling. Of course, for me, the fact there's a CD coming out is good too. Do you know when we'll see that? Mid-March is the best I know right now. We're preparing things now and will be happy to see all the singers and such credited. Are you happy with all the selections that were made? I think Lucy did her own singing, as did Kevin Smith and Ted Raimi. I think mainly the people who did not were Hudson and Renee. Yes, Renee and Hudson. The vocal resemblance between Hudson and Michelle Nicastro is striking. Their vocal qualities are very similar. Hudson was in the studio when Michelle recorded her part, which was really great because Hudson got to explain to her a little about her character so she left with an interpretation she was happy with. Hudson was a real pro. She was really well prepared. Susan Wood is a dynamite singer and Renee emoted beautifully for it. It worked out really, really well. Lucy is amazing. Lucy gets into heavy emote mode in the final number. And she did the singing and dancing -- she's the ultimate trooper, she's just so talented. I've had the opportunity to get to know her a bit. To get to work with her was just another treat because she's great. She'll go to any lengths to get it, to do it until she's happy with it, which is what you'd always hope: for someone to have that kind of resolve. And the results are heard in "The Love of Your Love". I've had a number of people tell me they were in tears at the end of that episode because that final number was so powerful. I was in tears, but for other reasons. [both laugh] I did find myself that way a couple of times, after living in that world for weeks. I was thinking, "I must be really tired", but the fact that other people got that reaction from it is really great. It was really a big goal of Rob's that, emotionally, the episode delivers the goods at the very end. It's unfortunate that in the show business community and the bias against syndicated shows that it won't be put up for as many awards as it deserves. Well, DESTINY (36/212) was a very nice surprise. It caught us all by surprise. I hope it was a boost for everyone involved in the show because it should be. People should feel their work is equally deserving and perhaps it was a step toward that kind of recognition. For the Emmy, being a composer who doesn't use California as his base, to be nominated from within the community when I'm not really living there, that's great. It's truly recognition from your peers. 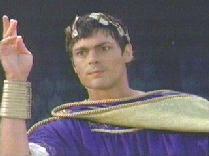 And you have the success of the CDs as well from Hercules and Xena . It's nice that they're out there, and it's nice that Robert Townsend does support the effort. You have fewer opportunities with television shows to have the music out there. I hear there's a dance mix CD coming out as well. I don't really want to talk about that right now. [smiles] More on this later. There will be a Young Hercules CD coming out. Did you do the music for Amazon High as well? I'm just getting started on that. It's not finished until the end of May. Do you find you suffer from split personality having to jump around from all these themes? And they are different. Hercules is a very heroic score, major key thing. 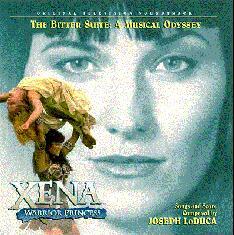 Xena has a minor key, deeper kind of mood to it. They have different feels to them. Hopefully, they always have different feels to them. Nice of you to observe that. It's certainly conscious on our part. They are cousins, though, so it's not that much of a leap. Young Hercules is related and we'll see about Amazon High . I know about the new direction, the new elements I want to put in the score, but it's a cousin of Xena . We're in the same continent, if you will, of music. AMERICAN GOTHIC was very innovative, and a bold experiment for television. The challenge was really the year I was working on American Gothic (tv, 1995-1996) and Hercules and Xena . That truly was an "about face". The music styles were so different. In one place we're dealing with guitar and harmonica, and then we deal with colorations that are varying shades of dried blood. I've noticed that -- I've seen American Gothic as well. The sense and the feel you get in something like that is much more suspenseful. The genre is different. Things work differently there than they do in the action/adventure realm. Yes, they do. In terms of switching the physical setups for the equipment was a challenge. I should have had separate studios. I enjoy all kinds of different music. With these shows, there's no stone unturned. There's a Hercules comedy we did where the musical approach is all salsa. It takes place in contemporary times in Los Angeles. This is the upcoming YES VIRGINIA (H74/415)? Yes. My idea for that was to go with salsa. I noticed on my last trip to Los Angeles that salsa was very popular. It probably always has been. [both laugh] But it plays off a certain lightness and presents a thematic approach which I always try to do with every show. So you're into the theory of leitmotifs? It could be leitmotifs, but it also is the fact I'm just into the theory of environment. 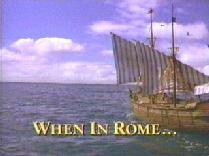 There's an episode where Xena has to deal with the Roman Triumvirate -- Caesar, Crassus, and Pompey. Don't get too comfortable with the ship until you see TSUNAMI. This must be for WHEN IN ROME (62/316). My whole approach to that episode is that Rome is one messed up place. It's really out there. It's sick and it's out there. It's sort of the Rome you see in movies, but not quite the same. I try to do that with every episode in some way, even at this stage of the game. We keep trying new things if we can. With music as so much a part of your life, how much time do you spend just listening, as opposed to spending time composing? There's not a whole lot of time for listening. It's not my choice to listen to music, although it can be a wonderful inspiration. I kind of need silence after getting through these shows every week. I kind of not need to hear it. My home is probably, in some ways, strangely absent of music because of all the sounds going through it during the week. [both laugh] It's definitely a wonderful experience for me to listen to good music. It's not part of my regular activity though. It's something I don't have a lot of opportunity to do. I might pick up an exotic instrument and learn to play it better, but I think listening is for another time. Save that for your declining years or something. [laughs] Yeah, right. Obviously I've heard a lot of music to get to this point. I didn't know that my interest in literature and growing up without any musical prejudice was going to make me ideally suited in a way for this kind of work. I had no idea. I just followed my natural instincts. Thanks to Rob and Sam I ended up in the right place. It's been a very fruitful association for all of us. I'm so happy to be doing this work for them. I never would have chosen to write a musical in a million years. It's not something I've had a passion for. I've always had a problem with musicals. Maybe as I'm getting older I can appreciate what they're about a little more. It's always been so contrary to suspension of disbelief. It doesn't take a lot for me to suspend my disbelief, but I could never get over the hump with it. I've certainly gained an appreciation for people who work in that idiom, and understand a bit more having done one. I enjoy the kinds of things a good lyricist and good choreographer can do. I don't know if it's a common experience or not, but I have to see a musical several times before I appreciate all the nuances and such. I know some isolated songs, and I've played in the pit for A Little Night Music (Stephen Sondheim) way back when. But I don't have a lot of experience with musicals. People have compared THE BITTER SUITE (58/312) to LES MIS , but I've never seen LES MIS and I don't know three notes from that show. People I think will tend to associate things with what they know and will find things to compare with even if they may not be there. I found myself through each act taking only about three or four breaths. How Rob was able to pull it off in only 42.5 minutes I'll never know. Because we have as many songs as you'd have in a full-fledged musical. Absolutely as many, from what I understand. And that's only from watching the beginning of all my children's Disney tapes. My son will say, "Seven new songs"! Well, we wrote seven new songs. Peace/War was one of the most complex scenes, and also one of the most memorable. In an unfair question, and to put you on the spot, do you have a favorite song or moment? No, I had fun doing it all. The whole process was fun. 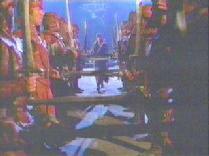 Xena doesn't use a lot of woodwinds. The "War and Peace" number was a lot of fun. It was great to get an orchestra to play to what Rob calls the Quaalude Tango of "Melt Into Me". Every one of those things had their moments. The fact that I used a singer I've admired for a long time, Phil Marcus Esser, on the "Hate is the Star" song. All of those things. "The Love of Your Love" was a little more personal, and it's a beautiful message. Forgiveness is not an oft-sung topic, that's for sure. Everything comes back to what I think is the theme of the whole show, and that's the story of two friends. Every friendship has it troubled spots and its bright spots. Yeah! And the fans definitely got that. There's a lot to be dazzled by when you watch the show, but the heart of the matter is something very serious and very honest and truthful and sincere. They're good messages to put out there. It's something everybody can think about. I know it's television and entertainment and all that, but I had a friend who understood this right away and asked, "Are people going to get this? This is deep for episodic television". People are going to be talking about it for a long time to come. It's sparked a lot of conversation, more so than any episode this season, even more than THE DEBT (52/306) which itself was very intense and thought-provoking. Apart from DESTINY (36/212), my favorite episode is THE DEBT PART I (52/306). I loved the places where the music wasn't. In a typical episode there are not many of those places. For various reasons, not necessarily always my choosing, but it's for the greater good. It's nice to be able to talk about the music for the show, and I'm glad there's been a good response to it. I'm excited to talk about it. It's been a great experience. I welcome the chance to share it. Until the next time, you know? It's too early to talk about. You never know. I like to be surprised as well. Who doesn't like to be surprised? [both laugh] We'll just see. When I heard about this season I was just blown away. We'll find out what's in store. It's so great that Rob and the writers have handled things so responsibly and no one has rested on their laurels. It keeps it interesting for me, otherwise I'd write the same show every week, which I can't. I'm proud to be working with everyone who makes the show. Well I know it's late and I don't want to keep you too long. We haven't seen the last of Caesar. He's coming back in Season 4! Yeah, I have to get back to work. I have to finish burning down Rome. And enjoy New Zealand! Give my best to everyone down there. Good on 'em! Will do. Thanks very much again for your time and patience.